For the 24 hours to 23:00 GMT, the AUD rose 1.71% against the USD and closed at 0.7202. LME Copper prices declined 0.1% or $3.0/MT to $6070.0/MT. Aluminium prices rose/declined 0.7% or $15.0/MT to $1961.0/MT. In the Asian session, at GMT0400, the pair is trading at 0.7198, with the AUD trading 0.06% lower against the USD from yesterday’s close. Overnight data showed that Australia’s producer price index (PPI) advanced 2.1% on a yearly basis in 3Q 2018, compared to a gain of 1.5% in the previous quarter. Furthermore, the nation’s seasonally adjusted retail sales climbed less-than-anticipated by 0.2% on a monthly basis in September, following a rise of 0.3% in the preceding month. 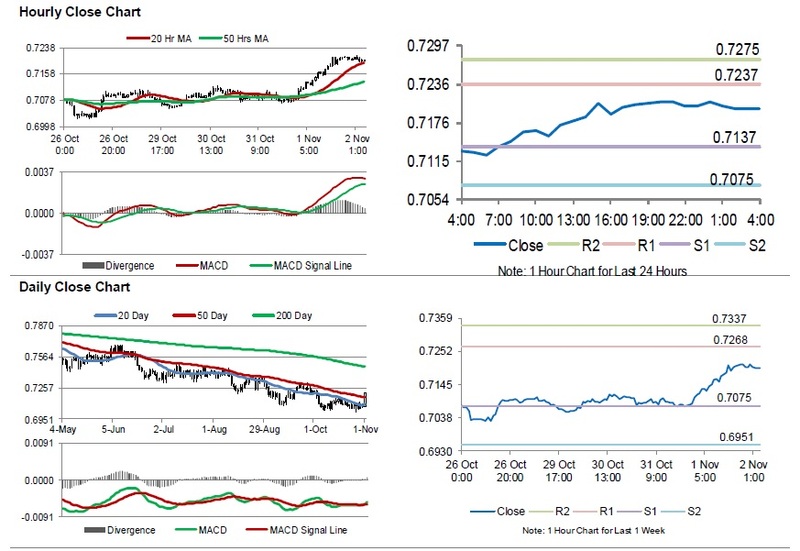 The pair is expected to find support at 0.7137, and a fall through could take it to the next support level of 0.7075. The pair is expected to find its first resistance at 0.7237, and a rise through could take it to the next resistance level of 0.7275.